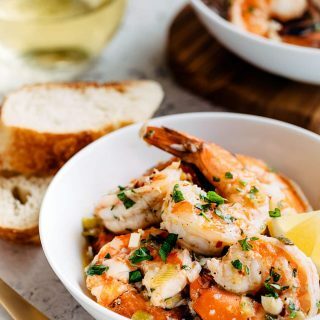 In just 30 minutes, you can have tender shrimp enrobed in a garlicky white wine butter sauce for dinner. This Italian-American dinner classic is equally well-suited to dinner on a cozy night as it is to entertaining guests. Preheat broiler with rack 6-inches from the element. In a large, broiler-safe skillet over medium-high heat, melt together butter and olive oil until foaming subsides. Add garlic and red pepper flakes (if using) and stir until fragrant, about 1 minute. Stir in scallions, lemon zest, salt, and pepper. Add wine, reduce heat slightly, and simmer for 2-3 minutes. Remove from heat and add shrimp, tossing to coat them with the butter mixture. Arrange shrimp in a single layer. Place pan in oven and broil shrimp for 3-4 minutes per side, until they are pink and opaque. Do not overcook. Stir in lemon juice and parsley. Serve over pasta, rice, or with crusty bread to dip into the butter sauce. If you are unable to source U15 sized shrimp, this recipe is also delicious made with extra jumbo (16/20) and jumbo (21/25). Smaller shrimp will need less time under the broiler, so start checking them for doneness after 2-3 minutes. This recipe appeared on stripedspatula.com.